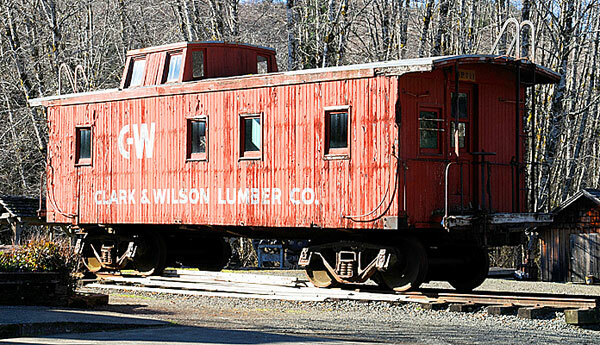 The Clark & Wilson wood-sided caboose saw many miles of service behind log trains. This is just one of the highlights when visiting the Camp 18 Logging Restaurant. 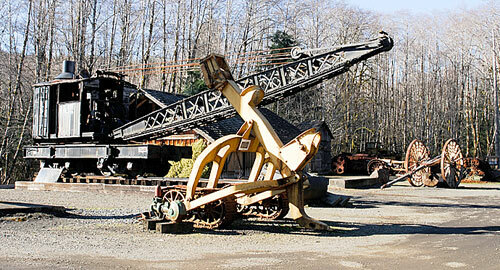 The Camp 18 Logging Museum is an integral part of the restaurant property. 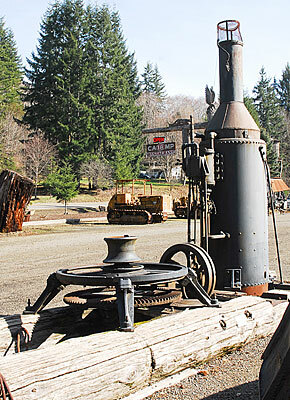 Those who want to learn more about logging history in the northwest, or who simply are curious about vintage logging machinery, will find plenty of material at Camp 18. Outdoor displays include multiple steam donkeys such as a Dolbeer single spool, a very early first-generation model, to a high-tech late-model Willamette compound geared yarder that was the height of technology for its day. Other displays on site include a large bandsaw from a sawmill, a self-propelled Ohio steam crane, Caterpillar-style tracked vehicles that worked in the woods, a railroad skeleton log car and other heavy equipment plus a wide variety of large and small hardware. The single-cylinder vertical-spool Dolbeer donkey is among the first steam donkey models to work in the woods. 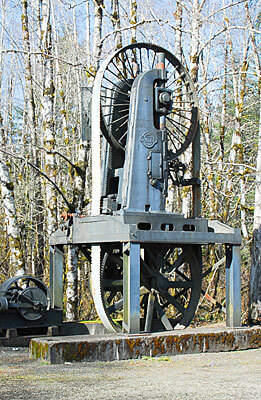 The double-bitted bandsaw on display once worked in a sawmill in the Pacific Northwest. 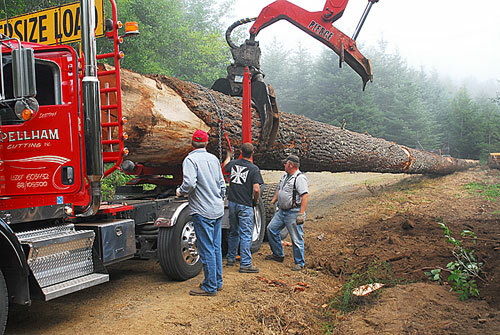 This is one neat piece of logging machinery. Informative place cards at each display explain the history, function and details about each piece of equipment. The museum also houses a large vintage photograph collection. Some of the images are on wall display, but many are being digitally cataloged thanks to the generous and ongoing volunteer efforts of Glenn Comstock and Phil Schnell of Timber Times Publishing. Our museum has a variety of ongoing restoration and preservation projects underway. Chief among these is rigging and raising the new spar tree to replace the existing spar. The 161-foot spar tree that’s now standing has reached the end of its useful lifespan. We have the new tree, which has been professionally treated with preservatives to ensure a long lifespan in the rugged Oregon Coast Range environment, in place and ready for use. Rigging and raising the new spar tree will be a fascinating project. the displays at The Camp 18 Loggin Museum. Due to the nature of the spar tree project, which uses all volunteer labor and donated equipment, the work days when interesting phases of the project are happening can occur on short notice. If you’d like to watch when something fun is going on and be on the email list for these work days, send an email to spartree@camp18restaurant.com and put “Spar Tree” in the subject line. We’ll notify you when something interesting will be taking place. The Loggers' Memorial is an exciting new project we have underway at the Logging Museum. The Memorial will touch the lives of many families by honoring loggers from all generations. For complete information about the project, click here. You are invited to be a part of the Friends of Camp 18 Logging Museum, Inc. We’re opening up our membership to those who wish to donate time, materials or funds. Membership cost is $10 annually. The Museum is a non-profit corporation dedicated to the assimilation and preservation of logging history. We are a 501 (c) (3) charitable organization recognized by the Internal Revenue Service. Send your $10 donation along with your name, address and contact information to: Camp 18 Logging Museum, 42362 Highway 26, Seaside, OR 97138. New! 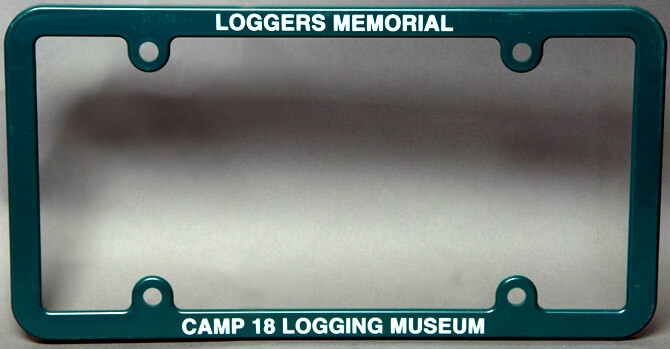 Promotional license plate frames for the Camp 18 Logging Memorial and Loggers' Museum. These plastic frames are designed to bolt directly to your license plate and permit full legal visibility of the lower-corner date tags. Your purchase of these frames helps support the ongoing historic artifact and display recreation activities at the Camp 18 Logging Museum and Loggers' Memorial in Elsie, Oregon. The frames are available in the gift shop at Camp 18, or you can purchase them online for $10 per set, at TrainVideosAndParts.com.